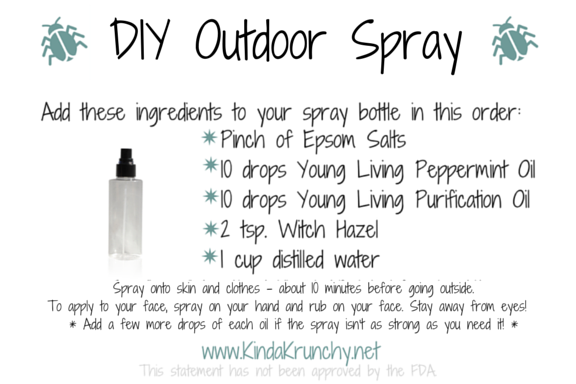 I am so excited to have found a chemical-free outdoor spray that I can use on my little ones! Even better — it takes just a couple of minutes to mix together. I put on the lid, gently swirl the bottle, and spray on my little ones’ skin and clothes about 10 minutes before we go outside. To apply to their face, I just spray some in my hands and rub it on them. Always be careful around your eyes and ears — essential oils should never go into eyes or ears! You can apply the camping spray and go outside immediately — I have just noticed that with my little ones it works better if we give it time to absorb into our skin. Now you can enjoy the rest of your summer outside! 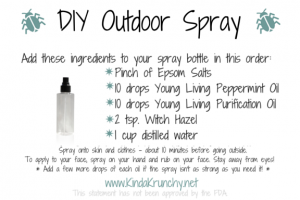 This entry was posted in Going Oily and tagged chemical free, diy bug repellent, essential oils, peppermint oil, purification oil, young living. Bookmark the permalink.